Acklam Hall is to play host to a unique night paying tribute to Brian Clough, led by three former Teesside football stars who knew him better than most. Main speaker at the sportsmen’s dinner will be John McGovern, who was given his Hartlepools United debut by Clough as a 16-year-old before going on to captain his title-winning Derby side and leading Nottingham Forest to league and European Cup success. McGovern will also take part in a Q&A alongside Clough’s former Middlesbrough strike partner Alan Peacock and former Boro star Mark Proctor, who Clough signed for Nottingham Forest. Acklam Hall holds its first ever Sportsmen’s Dinner on Friday June 8 to mark 25 years since one of Middlesbrough’s most famous sons ended his career as one of football’s most successful managers of all-time. Peacock was Clough’s striking partner as the scoring legend netted 204 goals in just 222 games for Middlesbrough in the late 1950s and late 1960s, while Proctor enjoyed a love-hate relationship with the abrasive Clough after leaving Boro for Forest as a 20-year-old. McGovern, who was brought up in Hartlepool, was signed by Clough at Derby, Leeds and Forest. All three speakers will recall great tales of Clough, many of them hilarious, as part of a night hosted by Riverside PA announcer Mark Page. Funds from an auction and raffle at an event that features a three-course dinner will go towards Acklam Hall’s chosen charity, Teesside Philanthropic Foundation. Tickets are £55 each or £500 for a table of 10. 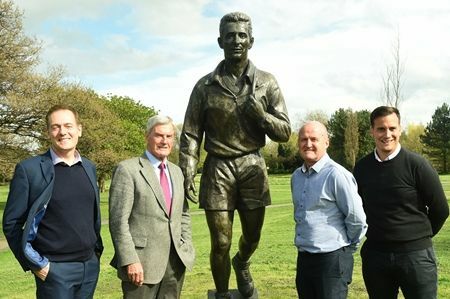 Teesside Philanthropic Foundation chairman Andy Preston (left), former Boro stars Mark Proctor and Alan Peacock, plus Acklam Hall’s Michael Jones with a statue of Brian Clough. Acklam Hall’s first Sportsmen’s Dinner featuring Proctor and Peacock will raise funds for the Foundation.